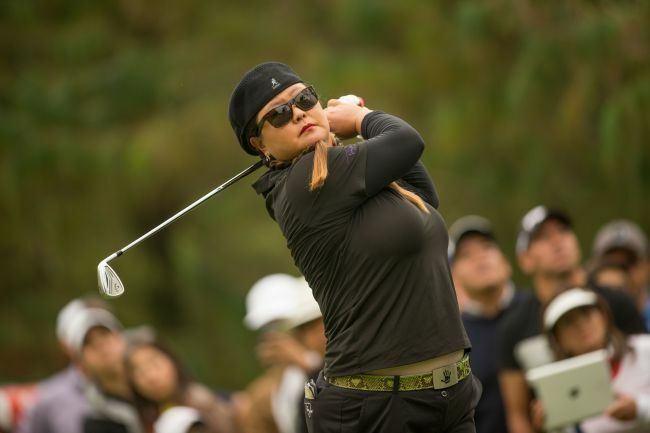 MEXICO CITY (AFP) ― Christina Kim, who is seeking her first LPGA win in almost a decade, posted a 4-under 68 to take a five-shot lead into the final round of the Lorena Ochoa Invitational. The 30-year-old American has one of the longest winless droughts on the tour ― her last victory came in 2005 at the Tournament of Champions. Kim, who began the day just one shot ahead of Paula Creamer, finished 54 holes at 14-under-par 202. “I’m just here to enjoy myself and really just go out and try and play some good golf and try to give the people of Mexico something to enjoy while we’re out here,” Kim said. China’s Feng Shanshan also shot a 68 at Club de Golf Mexico, which vaulted her into sole possession of second place at 9-under 207. South Korea’s Ryu So-yeon (69), Pornanong Phatlum (71) of Thailand and Spain’s Azahara Munoz (71) are all tied for third at 8-under. World No. 1 Park In-bee got into contention with a 3-under 69 and she is alone in sixth at 7-under 209. Kim was steady once again on Saturday as she began her day with two birdies on her first three holes. A bogey at the par-three fifth hole was just Kim’s third of the week, and it was the first and only one she made in the third round. “I’ve been really working hard on the game. My caddy and I have been using the mindset every day is Sunday because the previous six weeks in Asia, I’ve been putting up really good scores on Sunday,” Kim said. Defending champion Lexi Thompson fired a 2-under 70, her third consecutive round in the 70s, and she is tied for 10th at 4-under 212. American Michelle Wie, the 2009 champion, shot a 1-under 71 and she is tied for 12th at 3-under 213. PLAYA DEL CARMEN, Mexico (AP) ― Jason Bohn looked out toward the ocean Saturday and knew it was going to be tough day at the OHL Classic. He kept it together long enough to take the lead. Bohn made a pair of birdies, and a pair of tough par saves that were just as valuable, for a 4-under 67 in the rain and wind that gave him a one-shot lead over Shawn Stefani going into the final round of the last PGA Tour event of the calendar year. “When we started, it was just a little bit breezy. It was nice. It was going to be a beautiful day,” Bohn said. Bohn was reminded on the final hole how tough it will be to capture his third career victory, and his first since New Orleans in 2010. He stretched his lead to three shots as Stefani, Ken Duke and 36-hole leader Michael Putnam kept dropping shots. On the 18th hole at the El Camaleon course of Mayakoba, Bohn tugged his approach to the left side of the green. Stefani, who made bogey from the bunker on the 16th and from a tee shot into the bushes on the 17th, made a 20-foot putt for one of only two birdies on the 18th hole in the final round. Bohn left his long birdie putt about 5 feet short and missed that for a bogey. That put him at 15-under 198, and his three-shot lead suddenly was down to one shot. Stefani is looking his first PGA Tour win. He lost to Justin Rose in a playoff at Congressional in July.